After A Day Of Legal Shock And Awe, What's Next For The Mueller Investigation? 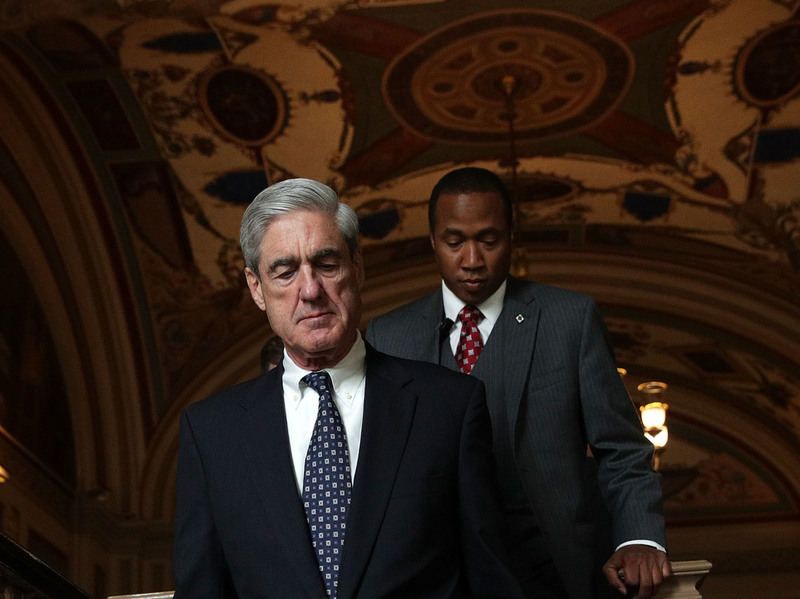 Months after he was named to investigate Russian interference in the election, Robert Mueller unveils charges against Donald Trump's former campaign chairman and a foreign policy aide. He's not done. Special counsel Robert Mueller (left) arrives at the U.S. Capitol for closed meeting with members of the Senate Judiciary Committee on June 21 in Washington, D.C. Among the charges facing former campaign chairman Paul Manafort and his right-hand man Richard Gates is failing to register as agents of a foreign government, and making false and misleading statements about that. The grand jury indictment unsealed Monday accuses the men of working on behalf of Ukraine and telling the Justice Department their activities "did not include meetings or outreach within the U.S."
Those charges are controversial, in part because violations of the Foreign Agents Registration Act are rarely enforced. Kevin Downing, a lawyer for Manafort, told reporters outside the courthouse that prosecutors have used that "very novel" charge only six times since 1966, winning just one conviction. On Capitol Hill, however, Senate Republican Charles Grassley of Iowa offered praise for that approach: "It's good to see the Justice Department taking seriously its responsibility to enforce" the law, Grassley said in a written statement. "I've been raising concerns about lackluster enforcement of this foreign influence disclosure law for years now, regardless of administration or political party," he added. "The dirty little secret is that lots of people across the political spectrum in Washington have skirted their FARA obligations for years now with little to no accountability." Grassley convened an oversight hearing on the issue in July, flagging work by Mercury LLC and the Podesta Group on behalf of what he calls "a front for the Ukrainian government." The firms are mentioned in the indictment as "Company A" and "Company B." A prominent Democratic lobbyist, Tony Podesta, announced he would step down from that firm Monday after the charges became public. At least one other person with ties to the Trump campaign, former national security adviser Michael Flynn, belatedly filed a foreign agent registration with the Justice Department this year connected with his work on behalf of Turkey. He has not been charged with a crime. Despite an onslaught of pressure from federal investigators, including an FBI raid on his residence in July, Manafort has steadfastly denied wrongdoing, and people close to Manafort say he has little of use to offer the special counsel. Even so, the 31-page indictment suggests that federal investigators are not finished squeezing him. Authorities want to seize Manafort's properties in New York and Virginia, at a time when he's already strapped for cash. The court papers refer to business dealings with Manafort's daughter and son-in-law, who have not been publicly charged with any crimes. And the Manafort indictment doesn't refer to contacts between Manafort and Russians with close ties to Vladimir Putin, despite media reports that he emailed with a longtime Ukrainian client in Putin's camp to offer private briefings on the election. The guilty plea by George Papadopoulos, a 30-year-old former foreign policy adviser to the Trump campaign, detailed a series of contacts he had with people close to the Russian government in 2016. The court documents said Papadopoulos reported his conversations to a "supervisor" and "high-ranking" members of the campaign team. Investigators said that after his secret arrest in July, Papadopoulos has been meeting with the government "on numerous occasions to provide information and answer questions." The message: He may be offering evidence against others still under investigation. Other people inside the Trump campaign also are said to have received overtures from Russians or Russian agents at about the same time that Trump named Papadopoulos as an adviser. One of them, Carter Page, traveled to Moscow at least twice last year. Thomas Breen and Robert Stanley, lawyers for Papadopoulos, said they had to refrain from comment on the case for now. But, they added, "We will have the opportunity to comment on George's involvement when called upon by the court at a later date. We look forward to telling all of the details of George's story at that time." 4. Will Mueller keep his job? Congressional Democrats reacted quickly after the indictments to insist that the independence of special counsel Mueller and his team must be protected. Senate Minority Leader Chuck Schumer said the rule of law is "paramount." "The president must not, under any circumstances, interfere with the special counsel's work in any way," Schumer added. "If he does so, Congress must respond swiftly, unequivocally, and in a bipartisan way to ensure that the investigation continues." At the White House, press secretary Sarah Huckabee Sanders said there was "no intention or plan to make any changes in regards to the special counsel." Trump lawyer Jay Sekulow told CNN he's had no conversations with Trump about issuing pardons for Manafort or others implicated in the Russia investigation. But Mueller could charge more people in Trump's world and bring even more heat onto the president's camp — which might prompt Trump to revise his thinking about trying to get rid of the special counsel. And legal experts say they don't know what might happen if Trump exercises his sweeping power to pardon people in a way that obstructs the Mueller probe.